Tour Inclusions: private tour guide, private transportation, entrance to the Mont St. Michel Abbey, taxes, tolls and parking. 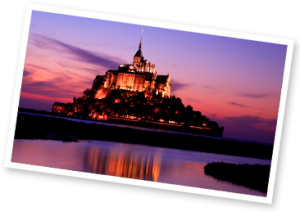 Embark on one of our a Mont St. Michel private tour from Cherbourg. Mont St. Michel is one of the most unforgettable places in France. An excellent Normandy tour guide, English-speaking, will conduct a private tour. Mont Saint Michel, whose namesake bay boasts one of the world’s highest tidal ranges, is a truly memorable sight. 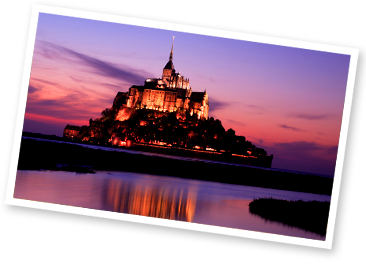 You will begin your Mont St. Michel private tour with a stroll the steep narrow streets of the village and its ramparts. Hear the history of this amazing site and see the highlights of the village on your walking tour. The Mont St. Michel private tour also takes you to the Abbey, founded at the turn of the 8th century. The Abbey became a major cultural and pilgrimage center during the Middle Ages. You will visit the Romanesque Church, the Gothic “Marvel” with the monk’s cloisters and refectory, the Knights Room, the Guest Room, the Undercroft, the Refectory, and more. The tour also includes several chapels: St. Stephen, St. Martin, Our Lady Underground, St. Mary Magdalene, and the 11th-century Crypt of the 30 Candles. Time permitting, on the drive back, you will tour the town of Villedieu les Poêles, famous for its numerous artisan shops selling exceptional goods made of leather, lace, copper and tin.